Webster University celebrated the first total solar eclipse across the continental United States since 1931. Because Monday's total solar eclipse was the first to cross the continental United States from coast to coast since 1918, excitement and anticipation had built for years. And with the path of "totality" -- in which the moon's shadow completely blocks out the sun -- being such a narrow band, people made plans all summer to travel hundreds of miles to be in one of the prime viewing spots. One of those spots was Webster University's home campus in Webster Groves, where Webster was founded just three years before the last such coast-to-coast total eclipse. The narrow path of totality (total darkness) went from Oregon to South Carolina, delighting multiple Webster campus locations in it shadow. A special viewing event at the home campus was the highlight of a party attended by more than 850 people. 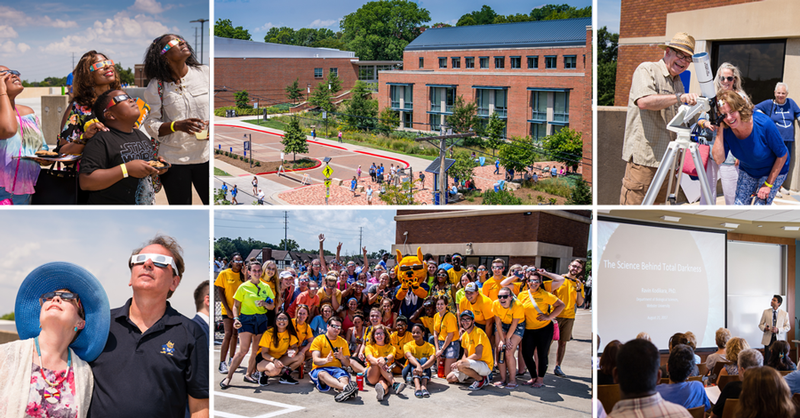 To celebrate, Webster University put on a show complete with food trucks, sun- and moon-themed music, children's educational activities and academic lectures presented by Webster faculty suited for the occasion. 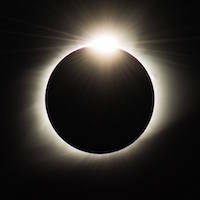 A wonderful and unique experience led to the moment of totality, where those on campus saw the sun completely blocked by the moon for approximately 75 seconds. Hosted by the Department of Biological Sciences and and the College of Arts & Sciences, as the RSVP list grew over the summer from 100, to 300, to 800 and more, many from departments throughout the University pitched into help handle the influx of visitors to Webster. A committee including biological science faculty members Ravin Kodikara, Victoria Brown-Kennerly, Mary Preuss and more spearheaded the educational programming, while dozens of faculty and staff pulled together to enrich the activities and share information about Webster academic programs with visitors. Certified ISO solar eclipse glasses were provided to guests by the University, the same glasses handed out in community outreach during the Webster Groves Community Days Parade on Tuesday, July 4. On campus, community members had the opportunity to watch from atop the Garden Ave. parking garage across from the East Academic Building and in the parking lots around the Multicultural Center where several food trucks also parked. Many more spread out to the University quad, to the gardens between the Thompson Music Building and the Loretto-Hilton Center, or on the grounds of the new Browning Hall, interdisciplinary science building. President Elizabeth Stroble and Provost Julian Schuster shared remarks and encouraged the community to return to Webster, as many guests were enjoying their first exposure to campus. University photographers and videographers captured the eclipse in beautiful detail, while community members shared their experiences on social media with the hashtag #WebsterEclipse. It was a day that attendess will never forget. It was an occasion to come together as a community. And it was a moment to appreciate, as Anton Wallner, the new dean of the College of Arts & Sciences, said in his pre-totality toast, "the aesthetic beauty of science and the mathematical precision of natural phenomenon."